Now that it’s actually springtime in Seattle (at least for another day or so), it’s hard to remember having been in the snow up in Whistler early last month. But watching a rerun of Anthony Bourdain’s No Reservations show on Vancouver a few days ago brought back to mind my great trip north early March. As is my habit, I took the train up to BC. I haven’t driven to Vancouver (nor to Portland, for that matter) since Amtrak started the Cascades service along this corridor. The really sleek Talgo cars used on the Vancouver route were out getting spiffed up in advance of the Olympics traffic early next year, so we rode on more traditional cars. But the route is the real star, gliding along the shoreline in many spots, only occasionally skirting I-5. Once in Vancouver, my sister and I had about 30 minutes to kill before boarding a bus from the same station that took us to the center of Whistler. Easy-breezy. We were lucky enough to be staying at the Four Seasons hotel there, a 2004 addition to the upper part of town at the base of Blackcomb Mountain. We had dinner reservations at the hotel’s Fifty Two 80 Bistro later that evening, but I couldn’t resist a trip to a favorite spot in town: Bearfoot Bistro. I’ve had a few splendid meals at BB in years past, but the real highlight is its cool champagne bar. There’s a strip of solid ice that frames the bar area, with indentations where your foot-less champagne flute nestles perfectly to stay chilled between sips. We chose the Blue Mountain rosé sparkling wine from the Okanagan, a 2004 vintage that spend a few years on lees. It was the perfect partner for a sustaining bowl of truffled fries, with a decadent dish of truffle aïoli alongside. Oh my, what a perfect snack! Dinner back at Fifty Two 80 was a delight. What’s not to love about a salad course that includes lobster, shrimp, truffles, avocado, tomatoes…all under a heap of fried thin slivers of leek? Nothing! It was wonderful. Barb had a generous salad of grilled vegetables. For my main, I went with the night’s special: venison with crosnes, wild mushrooms and a fig-blueberry jus. Delicious. I love crosnes, which remind me–in flavor at least–a bit of Jerusalem artichokes/sunchokes. Rarely see them on menus, so I may likely order a dish just for the side! My sister’s pasta was rich and creamy with cheese, and packed with wild mushrooms. We sampled a glass each of two other local wines: Laughing Stock Cabernet and Kettle Valley Merlot, both outstanding, lush, balanced. I really love the feel of the spacious room, it’s very relaxed, cosy, stylish in a low-key and slightly retro fashion. The fireplace in the dining room is accented with small colorful tiles, the club chairs in the lounge area an endlessly inviting spot to linger over cocktails and snacks, visit with friends, warm up after a day on the slopes (or walking around town). Alas, time in Whistler was brief. One night, just a few hours the next morning to enjoy the hotel (a dip in the outdoor pool, a little steam and sauna time, blissful! ), have some breakfast and do a little shopping in town. Back on the bus for another gorgeous trip on the Sea to Sky highway between Vancouver and Whistler. It’s had a lot of work since my last trip up that way, but they’re still blasting and widening and working on that roadway that will carry so many folks to some of the key Olympics venues early next year. Vancouver had us at the sister Four Seasons property of our Whistler stay. This is a great central downtown spot that has some rather unusual curb appeal–they did wonders dressing up the sitting area at street level, where the vehicle drive-thru is, but really you don’t see much of the hotel’s character and style until you’re well inside. They’ve put millions into the interior over recent years, though, and it’s definitely worth a visit. The main restaurant, now called Yew, has been significantly revamped. I’m always charmed by large spaces, high ceilings, dramatic interiors. Yew has that, in spades. Dramatic art, natural light, lots of Northwesty touches in the colorscape and wood-and-stone accents. A great spot for a simple pint of local pale ale, or an all-out dinner celebration. Our meal that night was spectacular. This seafood sampler plate was a great start, which included an octopus salad, raw scallops with radishes, a tuna poke with olives, and lobster roll. On to luscious cauliflower soup with black cod brandade, smoked sablefish with pea puree, a breast of local duck for my main course. All outstanding dishes, full of flavor and local color. Dessert was an embarrassment of riches, a sampling of what they might serve for a special 2010 menu they have on tap this year, leading up to the 2010 Olympics kicking off in February. For $2010, you’ll be served a 5-course dinner for 10 in their cool glass-enclosed wine room at the center of the dining room. My favorite of the desserts we sampled was the salted chocolate mousse. Divine. We hit town just a month or so after the new Shangri-la hotel opened. It’s a brand I wasn’t familiar with until recently, but anyone I know who’s traveled much to Asia clearly knows of the upscale hotel group. In fact, I was surprised flipping through my copy of The New Yorker last month to see a full-page ad for the hotel, touting it as the first Shangri-la in North America. It cuts a striking pose in downtown Vancouver, standing 61 stories tall, the tallest building in Western Canada. The first 15 floors are hotel, the remainder residences (which, as I understand it, have been selling pretty well despite the economic times we’re in). Luxury here translates into clean, sleek lines, simple but bold artwork, pretty understated all around. The lobby has a simple concierge desk and bell desk, but no registration. Most guests arrive by the underground drive, where a staff person greets them and they’re whisked up to their room where details of registration will play out. It may be a common practice for the super jet- set types, but I’d only experienced that one other time: the Halekulani in Honolulu. The hotel enlisted New York-based celeb chef Jean-Georges Vongerichten for the restaurant. Market is, like the hotel, sleek and elegant, surprisingly busy on a Tuesday night, tables packed, a nice buzz about the place. The signature truffle pizza with fontina is reason enough to head to Vancouver, really decadent. We sampled a number of dishes from the menu, including Dungeness crab dumplings with Meyer lemon and celeriac tea (ethereal), rice cracker crusted tuna with citrus sriracha emulsion, a few other delights. And amazing desserts, not the least of which a caramelized banana tart with praline and a silky caramel ice cream. It seems a bit as though all we did was eat and drink during the trip. And there are a couple other meals I want to quickly add as well. Lunch at Rangoli, the newer, more casual, sibling alongside celebrated Vij’s restaurant. We walked here after tooling around Granville Island for a while one morning. A marvelous, filling, flavorful lunch. And we joined some Vancouver friends at Fraîche high on the hillside of North Vancouver for a really fun and tasty dinner one night, marking the first anniversary of this popular restaurant. Chef-owner Wayne Martin had been chef at the Four Seasons Vancouver for a while before opening first Crave on Main, now this fun spot. It was nice to get out of downtown for a bit and join the locals! I’m excited for Vancouver and Whistler that they’ll be the home of the world’s beloved Olympic tradition come winter next year. I’m even more thrilled that it’s a few hours away from my hometown and will likely have just minor peripheral impact. I can’t imagine living in a city while it hosts such a monster of an event. 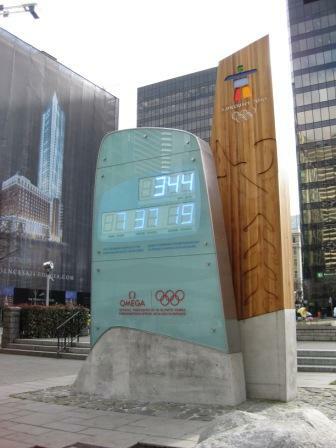 But the Olympic buzz sure is building, as this clock in front of the art museum counts its way down.